If you are working on Windows 8 or 8.1 operating system on PC, you may be aware about the new Ribbon User Interface introduced in Windows Explorer. In fact, Microsoft replaced the good ol' Command Bar (toolbar) in Windows 8/8.1 Explorer with MS Office 2o13 style Ribbon. However, Command bar or classic toolbar was easier than using Ribbon in Windows Explorer and you found it a little bit problem to click in different ribbon tabs to find their desired options. You can read a different tips to Remove Ribbon from Windows 8 and 8.1 Explorer Permanently without a third party software. Full Screen mode is the easiest way to extract out the ribbon from windows 8/8.1 explorer. But you can not do this permanently. Only you have to press Function key F11 to remove it which would show in Full Screen mode on your Windows Explorer. Now you will have access to old toolbar and Ribbon will no longer be visible in your Windows Explorer. Here you can remove the Windows Explorer Ribbon permanently when you rename the DLL file as “UIRibbon.Dll” with .dll extension and it will store windows 7 style of command bar. If you are working with paint as well as wordpad applications then you need not to use the mentioned methods. Otherwise you can remove the Windows 8/8.1 Explorer ribbon by only editing the DLL file in Resource Hacker. You have to edit the file name and remove the key section permanently without any side effects to your system. Here you can be able to remove this ribbon by using only Freeware Software. 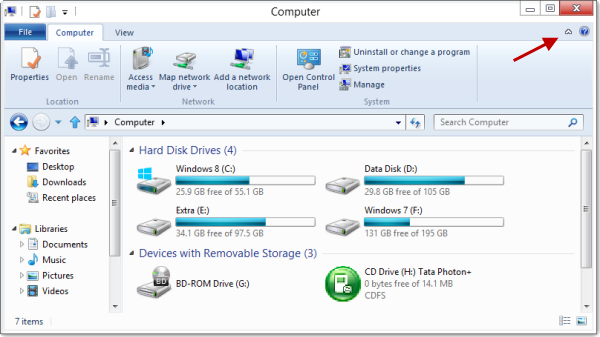 It will also help you to bring many other Windows 7 classic features back such as classical drive grouping, Details pane at bottom, etc. You can download the Freeware software by clicking the given link here. If you want remove the windows ribbon without removing the windows XP style classic toolbar in Windows 8/8.1 explorer then you have to modify the build in the quick access tool bar in Windows Explorer to make it look and work like classic toolbar. That's it.